You may have resolved to get more focused, motivated or productive in the past, only to get sidetracked by the significant amount of time it took to reach your goal. The good news is that you don’t need months, weeks or even hours. You can enhance your focus, motivation and productivity in just 30 minutes – or even less! A hydrated body is a healthier body. When you are hydrated, you will decrease fatigue and mental fog while enhancing productivity as much as 14 percent, according to a recent study. Interestingly, just a one percent decrease in hydration can lead to a 12 percent drop in productivity while a three to four percent drop can reduce productivity as much as 50 percent, according to Water Logic. Most of your brain is water – give it the fuel in needs. While some people envision a very quiet, still meditation experience, you can focus on more energizing options to increase your productivity next time you need a boost. For instance, try a walking meditation where you focus on your inhales and exhales and your feet moving forward – you will get some exercise along with your mindfulness. Or, try inhaling for a count of eight and exhaling for a count of four – the longer inhale can provide a perfect energy boost. A variety of easy, short and effective meditations are now available at your fingertips. Meditation can also clear your head and make space for your next project or next great idea. In an ideal world, everyone would consume a full five to nine servings of fruit and vegetables every day, get eight hours of sleep, exercise and enjoy just the right amount of down time. In reality, we are often tired, hungry and in a rush. That’s where supplements come in – they can quickly supplement what your body is missing and give you the focus you need to continue. Supplements such as vitamins and nootropics, also known as “smart drugs”, are designed to spark motivation and productivity and are a great option for all-day energy and production. Coffee and napping might sound contradictory, but new research has determined that consuming a small amount of caffeinated coffee or tea prior to taking a short nap can reap many rewards. You will enjoy the refreshing benefits of a power nap and then wake up ready to take on the world, bolstering your focus, motivation and productivity. Make sure you consume a small cup of coffee right before settling in for a short nap – if you allow a longer time interval to pass, it will be harder to fall asleep. Better yet, run around a few blocks. However, you do not have to run a marathon to enjoy the benefits of exercise. Even 20 minutes of exercise can stimulate your metabolism, increase your focus and up your productivity. Make short bursts of exercise a part of your productivity routine and both your mind and body will thank you. Sometimes it’s as simple as a few minutes a day to hone your focus, motivation and productivity. In just 30 minutes, you can potentially do all of the above: hydrate, meditate, supplement, try a coffee nap and take a quick run. 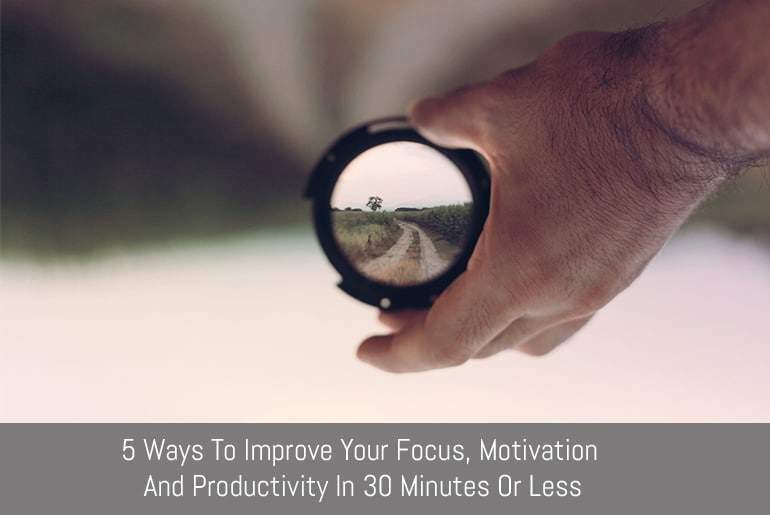 You can also focus on just one of these five simple steps to improve your focus, motivation and productivity in minutes. Dan Scalco is a columnist at Inc, Entrepreneur, and HuffPost. When not writing or working, you can find him learning to cook, running, or reading up on productivity hacks.